The Atmos VICOD 5G 2nd gen is one of the most compact convection vaporizers available on the market. It comes powered by an ultra-long-lasting and robust 2200mAh battery made from lithium polymer. This battery has an advanced temperature range from 300 to 435 degrees Fahrenheit. The Atmos VICOD 5G uses a ceramic heating chamber that allows for clean tasting flavors when vaping dry herbs. When you want to vape wax, you can take advantage of the wax cup that comes included in the unit. The second generation of the Atmos VICOD 5G has a memory function that automatically heats to your last used setting right away. The OLED display makes it simple to see the different settings such as vaping temperature. The Atmos Vicod 5G 2nd Generation is a compact herbal vaporizer that can also be used for wax and oils using the included titanium wax cup. The device is made with a reinforced and rubberized exterior that not only provides exceptional durability, it makes the Atmos Vicod 5G 2nd Generation easy to hold and secures it in the pocket as well. The rubberized exterior means that it is also heat resistant so it won't get too hot to hold. The 2nd Generation also gets its power from an impressive and robust 2200 mAh lithium polymer battery. This battery uses advanced temperature control technology that heats up the ceramic embedded heating element. Ceramic is incredibly efficient and produces clean vapor that allows for great flavor, increased potency, and lusciously dense clouds. Its temperature control technology heats the ceramic coil between 300 and 435 degrees Fahrenheit using precision control that allows you to change the temperature by 1-degree increments. This vaporizer even features a convenient built-in thermostat that gives you a more accurate temperature reading so you can be certain your vape will perform exactly as you want it to every single session. It has a convenient memory feature that automatically heats to your last setting when you power it on. Heating up the Atmos Vicod 5G 2nd Generation takes only a few moments to have you vaping in no time. Should you prefer to use oils in your Atmos Vicod 5G 2nd Generation, you can simply place the stainless wax cup that comes included with the kit into the ceramic heating chamber. Without paying exorbitant prices for hybrid vaporizers, you can turn your herbal vape into a wax one in just seconds. It also comes with a titanium wax cup if you prefer waxes over oils, making this a multi-functional portable vaporizer model. - Price - At a price of $124, this is a reasonably priced dry herb vaporizer, especially when you consider this vaporizer can also handle wax. - Vapor Quality - The vapor quality is immensely satisfying. It has a deep .5 gram chamber so you can get rich hits with every pull. The vapor is smooth and flavorful due to its ceramic heating element. Ceramic is great at heating up material thoroughly and evenly so you do not have to worry about uneven heating or poor tasting vapor. - Guarantee - The Atmos VICOD 5G comes with a limited five-year warranty. - Prep Time - It is simple to turn on the Atmos VICOD 5G, and it is easy to operate with the OLED screen that shows you the current and set temperature. Just use the arrows on the unit to set the temperature and then wait for it to heat up. - Portability - The Atmos VICOD 5G is ergonomic and comfortable in the hand, making it simple for carrying with you without fear that it will fall and break. - Ease of Use - The Atmos VICOD 5G is exceptionally simple to use. It only requires removing the mouthpiece and accessing the dry herb chamber or slipping in the waxy cup to use it for concentrates. - Heating and Temperature Regulators - The Atmos VICOD 5G can run anywhere between 300 and 435 degrees Fahrenheit, giving you the perfect selection of temperatures. This makes it ideal to use lower temps for wax and higher temps for dry herbs. 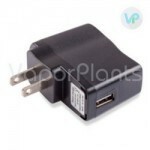 - Power Supply - It comes with a USB charging cable that makes it simple to charge anywhere. The battery lasts for a long time and can outlast several different sessions. Switch on the power by clicking the power button three times quickly. Pick out your temperature with the up and down arrows. Look for the temperature to appear on the screen. Wait for the unit to heat up to the desired temperature. The device's OLED screen will display "warm" while warming up and word "heat" when it is ready to use. Grind up your herb finely. Insert the material into the ceramic chamber. Use the cleaning tool that comes with the kit to clean the chamber out. Clean the screen using the same tool. Clean the screen about once a week in salt water depending on how often you use your vaporizer. Ready to experience the next evolution in portable vaporizer designs? The Atmos VICOD 5G second generation is the latest innovations from Atmos and will allow you to enjoy dry herbs and wax concentrates with more control and efficiency than you've ever enjoyed before. The Atmos VICOD herbal vaporizers have an advanced airflow system that allows air to move easily through the entire heating chamber. A luxury grade ceramic heating chamber is paired with this breakthrough technology. Together, the features allow the devices to heat all of the herbs in the chamber evenly and to produce a steady flow of vapor. You'll experience less wastage and a smooth, flavorful vape when you upgrade to the original Atmos VICOD 5G or its upgraded 2nd Generation. The Atmos VICOD 5G is a convection heating dry herb and wax vaporizer. Due to its versatility both in the two different materials and the multiple temperature settings, this unit is ideal for those who want to have total control over how they vape. It heats up in only 30 seconds and takes no time to fill up, making it an excellent choice for on-the-go use. Its rubberized finish and its sturdy body make it simple for you to take it with you anywhere. This is my first vaporizer so I can't speak to how it compares with others. I'm pretty much happy with it though;, in fact I bought a second one for my husband. This Vicod 5G is easy to load and clean, heats up in a few seconds, and produces good flavor. It's build sturdily and looks like it could survive being knocked around a bit. A vaporizer is hugely more economical and pleasant than smoking. I would but it again - Review by Gary V.
The Atmos Vicod 5Gi is an awesome vape. It is really efficient and only needs a tiny bit of herb to feel like it is effective. I got mine a year ago and it still feels effective to this day. This unit definitely surpassed what I expected by a long shot. I would buy it again and again. Overall happy - Review by Renee R.
I love it and am really happy with it. Always ready - Review by Melissa L.
The price is great for this vape. I love that it is always ready to vape and does not take up much time at all to heat. I didn't want something really fancy or pricey so to me this is perfect. Battery is OK - Review by Scott M.
The Atmos Vicod 5G gets the job done! Nice vaporizer - Review by Victoria J.
I like the Vicod 5G but I wish there was a way for me to use it with an attachment. Overall, though, it is really good to have. A bit awkward - Review by Lois W.
For the price that you pay it is a really great vape. It took me a little bit to get past the learning curve and figure out what I am doing but after I did that, it is safe to say that this vape is my favorite. I love how much vapor I get out of it. I love the 2nd Generation Atmos Vicod 5G. Excellent vapor - Review by Marylou M.
It is important that you follow the directions on the Vicod 5G if you want to use it to its full capacity. The draw is really low and slow and I am not a fan of that, but the vapor that it produces is excellent, so it’s something that I am happy to deal with. I have had it for a while and don't really have any complaints outside of that. Not a party vape - Review by Randy M.
I don't recommend this to anyone who has a group of people that want to use it. This is because of the drag time and the smallish chamber. That said, if you intend to use the Atmos Vicod 5G on your own it is definitely worth every penny you will pay. This is my first vaporizer so I can't compare this with others, but I will say that I'm pleased. This Atmos heats up quickly and is saving me an enormous amount of money compared with smoking. It's easy to load, easy to change out the herbs, and seems like a sturdy little machine. Quick, clean, easy to use. Comfortable to have in my pocket. Very compact. Small and easy to load - Review by Judith J. The Atmos VICOD 5G is the first vape I have ever owned. I bought it for use with dry herbs so I didn't want to buy something really expensive. I like that it is small and best for one person at a time because I usually vape alone. I like that it is convection as well. I wish it was easier to load but other than that, it is great. The mouthpieces are kind of weak but all around the Atmos VICOD 5G is an awesome vaporizer. I love Vicod 5G - Review by Charles A.
I love this Vicod 5G. Maybe the mouthpiece could be made out of silicone or something for the heat but other than that, it's wonderful. The Atmos VICOD 5G works as advertised. It is nice and compact so I can take it anywhere. I don't like that the exterior seems to be wearing off, but I can get over it. All is well with this vaporizer, I've had my Vicod for 7 months now, and I just placed another order for my girlfriend as a birthday gift. This vaporizer is compact and perfect for me to bring along with me wherever I go. I especially love it for when I travel. The Atmos Vicod 5G feels durable and solid so I won't need to be replacing it for quite some time. The only thing bad that I have to say about the Vicod vaporizer is its mouthpiece does not feel that durable, but with the durability of the rest of its body and the reliability that I have come to know, that is just fine by me. Plenty of flavor - Review by Mary J. The Atmos Vicod 5G is so easy to use that I wonder how I got along without it before. It was easy to experiment with the different heat settings to figure out which one worked best for me, and that made the vape feel customized to my specific style of vaping. When I found the right temperature, it started giving me plenty of flavor. The vapor was smooth and a little on the warm side, but I found that to be pleasant as it did not scratch my throat at all or hurt in any other way. Discreet vaporizer - Review by Phillip N.
This things is great, simple to use and does what it was intended for. Loading Vicod is a breeze, grind up the material and pack it in, 5 clicks and you are vaping in no time. After a few session, the atmos vaporizer does not even stink up the room, very convenient. I don't really have anything to compare the Atmos Vicod 5G to because this is the first vaporizer that I have ever owned, but I can tell you what I think about it. I did not want to commit to paying a ridiculous price for something expensive since I never used one before, so I went with this one, as it is relatively inexpensive and has good reviews. I am so glad that I did. It is small and perfect for use by a single person. I like that it is a convection vaporizer so I don't have to worry about it burning up. Vicod is easy to load and easy to use, which is important for me as a beginner. I don't have any sort of complaints really with the Atmos Vicod 5G except for the mouthpiece. I think it needs a little bit of work to make it perfect, but the rest of the unit is so great that I don't really mind it. It gives me smooth and tasty vapor and I don't have to pull too hard in order to extract it. It is simple to load up, which makes Vicod super convenient for use at home or on the go when I want a quick vape. The Atmos Vicod 5G takes a little bit of playing around with in order to figure out which temperature is the best, but after I figured it out, I never want to go back to another vaporizer again. The loading technique is simple and using it is even easier. The Atmos Vicod 5G mouthpiece gets a little hot when you use it, but other than that, it is a great vaporize for use at home or while out and about. I would definitely buy this vaporizer again. This is the second time I’m buying it, only because my brother asked me if he could have the first one. The temperature settings takes some time getting use to it but it does not bother me. It’s a bit harder to clean the chamber than i had expected, but than again I hate cleaning anything. Originally got it because of the price, you just can’t beat this vape pen price! I’m not very careful with my stuff, so I dropped this vape on the ground several times, I’m amazed it does not have a single scratch! One charge lasts me around 6 hours, which is more than enough for me. With the option to being able to charge it with my laptop, is a plus, so I always have it charged and ready. High quality vaporizer, small sleek, very good build, the herb chamber is easy to load & clean, thick cloud of smoke if you love them :), taste is great. By far best vaporizer in the 90-170$ Range. Buy it if you want to enjoy vaping . 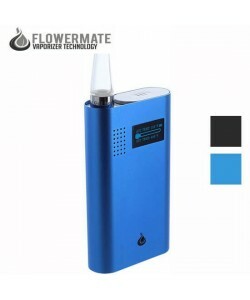 Pretty good Vaporizer for any Herbs - Review by Lilian L.
Definitely one of Atmos RX's true Vaporizers.Chamber holds impressive amounts of herbs so please don't over-pack it to let the air in. Easy to get to the desired temperature and it makes quality vapor. Battery life long enough for me, so with all the things put together, I am recommending it to first time and established vapers. VaporPlants guys are always very helpful. My Vicod Vaporizer by Atmos has been shipped out quickly and arrived a day faster than they quoted me. Definitely happy with my purchase and vaping experience. Hope this review is helpful! My Atmos VICOD has been great so far and heat up to 430 degrees is surprisingly fast. Quality vapor taste is delightful. Money well spent, since it doesn't waste any of my herbal materials it will definitely pay for itself in no time!